World Class Quality | 山崎金属工業株式会社 / YAMAZAKI KINZOKU KOGYO Co.,Ltd. It was 1991 when we decorated the Nobel prize winners' banquet tables with the highest quality cutlery. Our product, recognized globally, has been further enhanced by its quality. Our cutlery resembles works of art thanks to the innovation in manufacturing techniques by our artisans. Crafting first class products, utilizing human eyes, hands and time. What we value is “”craftsmanship relying on the eyes, hands and senses””. 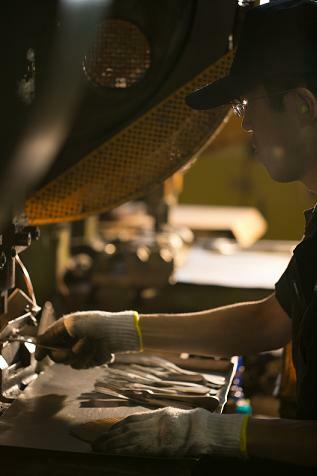 Half of cutlery production depends on craftsman’s press work, grinding and polishing, which are all manual labor intensive. These tasks require precision techniques based on the craftsman’s experience. Because of that, various technical restrictions and challenges are the sources of the uniquely original craftsmanship we treasure.Through improvising to overcome challenges and achieving our goals, new discoveries were made. Each experience has become an irreplaceable part of our corporate identity and culture. Our products are borne out of craftsmanship nurtured by our heart and soul over time. Our supreme quality explains the production processes needed beyond imagination. The quality of the raw materials used is critical for craftsmanship. Each piece of YAMACO/YAMAZAKI cutlery exhibits a deeply lustrous finish. The glossiness can be achieved in about 35 processes for normal designs and 50 or more for special ones. Ordinary cutlery sold inexpensively is said to be produced in about 10 processes. Our cutlery takes several times as much to produce. Inferior raw materials cannot be made into superior products. Selecting the best suited materials is the first critical step in craftsmanship. Polishing the surface of the raw material is not sufficient to extract the best out of it. The base sheet metal of materials is subject to a repeated forming process and heating at a high temperature to achieve a stronger and smoother surface needed for a deep gloss finish. These are essential not only for superior appearance but also for smoothness when held by a hand and contacted with the mouth. Our earnest artisans give excitement and joy to users of our cutlery. Our craftsmen are engaged in their work, envisioning our loyal customers buying and using our cutlery. When encountering abnormality in the production line, each craftsman coordinates with his fellow workers in the subsequent production processes and secures needed quality on finished products. Skillful artisans who can find solutions at the site when facing problems in the production line are tremendous asset to our company. They can never be replaced by highly modern machines.They will continue brushing up their skills and crafting quality objects through orchestrated efforts with fellow artisans. We must create our products in good faith and conscience with acumen. It is our mission to craft and offer trustworthy products to support the consumption of food, the lifeline of our very existence. To achieve the goal, we conduct the strictest quality control and inspection standards set in Europe for our finished products. We have successfully maintained the safety of our products by adopting a quality control system that meets the highest global standards. It is the duty of a manufacturing enterprise to be mindful of the impact of its production process on the environment. We must play our role to contribute to build a so-called material recycling society. In this particular effort of ours, we developed a method to recycle any left over materials. They are used to make candle holders and metal mats for hot pots and pans. Those are made into environmentally friendly products with minimal energy consumed.